a way for the TELED team to provide additional pop-up information where appropriate – for example, for a new feature or known issue. To get started, click the ‘Support’ button at the right of the screen in Blackboard. This feature will be developed and extended in the future. All 2016/17 modules will be available in Blackboard by 2 August 2016. On the 18th April at 9.00 am we will launch the “advanced receipting” feature for students submitting Blackboard assignments. * We will be monitoring the tool after launch. Please contact tel-help@bristol.ac.uk if you experience any issues. 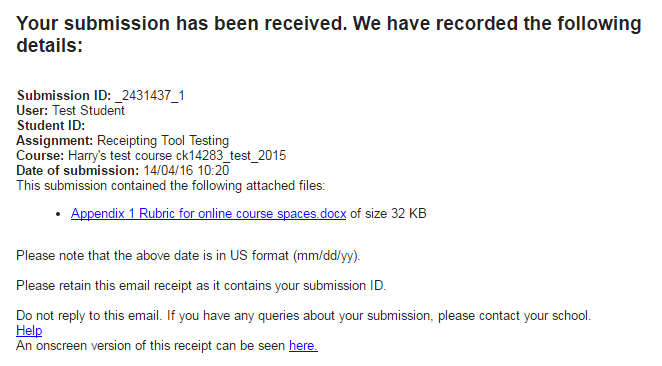 Following an assignment submission, students will receive an email confirmation. This receipt includes details on who submitted the work, the time of submission, the module title, the assignment title, and the name and size of the submitted file, as well as a link to our Help page. Students who submit an assignment after 9.00 am on the 18th April will receive the receipt. Those who submit before this time will not receive a receipt. *Students submitting an assignment to Turnitin through Blackboard already receive a receipt. A copy of the email receipt is stored within Blackboard. (Instructions on how to access these receipts. A screenshot of an example receipt is shown below. Staff – new to Blackboard? Look at our quick start guide or Help for Instructors for more detail. Both of these, and further guides can also be found on the Help Tab in Blackboard.